Raka's 2003 Quinary blend, so named because it contains all five Bordeaux varieties, really impressed everyone at the tasting I gave last week. 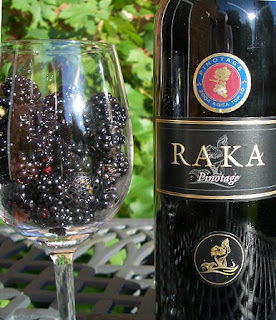 So I thought I'd open my only bottle of Raka Pinotage -- also from the 2003 vintage. This was a winner in the 2004 Top 10 Competition for which I must take some credit because I was one of the judges that year. Blackberries in a glass was the initial nose and taste. The wine was pale for a Pinotage and it was very soft. I wondered if it was because the grapes all came from such young vines. Raka was only established in 2002 way down the coast from Hermanus, inland from Stanford in an area so new that the Wine & Spirit Board had to create a new ward -- Klein River -- just for them and thus their vineyards are recently planted. Attractive as the wine was to begin with, with blackberries and red cherry flavours, as time went on a very dry and woody finish became apparent. Maybe bottle variation, but this wine was not as delightfully fruity as it was in April last year when I last drank it. This is a now a wine that requires food, and I think it should be drunk sooner than later. Closing date for this years Pinotage Competition is 15:00 Thursday 30 August 2007. 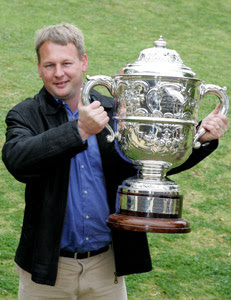 The complete rules and entry forms are still available on the Association's web site at http://www.pinotage.co.za/. The Pinotage Association have simplified the requirements and say "It has never been so easy to enter! Only 900 litres of a wine have to be produced to qualify for entry. No proof of certification, no specimens of labels; only a WSR 2A certificate of analysis is required along with the entry form." And for the first time, the competition is open to Pinotages made outside South Africa. Just look at the fizz in that glass! That bottle was was one of a case opened two days previously, on Wednesday, for a tasting I was giving. About two thirds was left so we stuck a cork in the neck, brought it home and stuck it in the fridge. Friday we opened it to pour a pre-dinner glass glass and recorked it. I expected it would have gone flat by Saturday, but no -- and there's the proof. 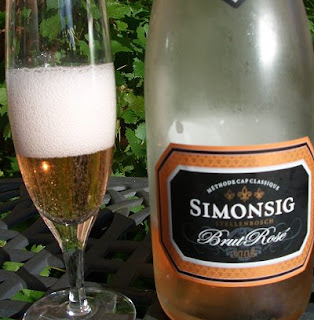 Simonsig were the first South Africa winery to make a methode champenoise sparkler, thirty five years ago, and their expertise shows. This is a super summer fizz; beautiful bright pale salmon pink colour containing billions of tiny bubbles. 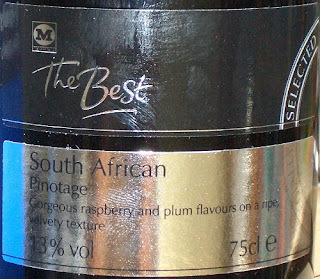 It is a vintage Brut but has a sweet mouthfeel from the Pinotage - yup it is 95% Pinotage with 5% Pinot Noir. Indeed, as a regular Brut Champagne quaffer, I found it a tad too sweet when not chilled right down, but this proved to be a real crowd pleaser. The only reason there was any left after the tasting was because some people asked for small measure since they were driving. Nelson's Creek invite you to join them at the farm this Saturday, 25 August, to celebrate their 20th Anniversary. It was in 1987 that Alan Nelson and his family (pictured left) acquired the bankrupt farm which with hard work they turned into one of South Africa’s prominent family-owned wine farms. Entrance plus wine, cheese and olive tasting is free of charge from 09:00 - 13:00. Nelson’s Creek and Nelson Estate wines, together with olives and cheeses from leading family producers will be sold on auction at bargain prices, starting 11:00. Quad bikes will also be on hire for vineyard tours and there will be mini quads and pony rides for the kids. The farm makes Pinotages under the Nelson Estate and Nelson’s Creek labels. Congratulations to the Nelson family -- here's to the next 20 years. 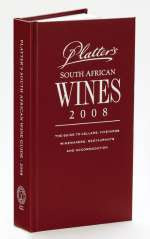 The 2008 Platter Guide 5 star winners have just been announced and it is disappointing to not to see any Pinotages listed. Although two top Pinotage wineries -- Kanonkop & Beyerskloof -- both achieve the coveted 5 stars, it is for Cabernet based wines. Especially galling in the case of Beyerskloof since the 5* winner is the only wine of their eight wines that doesn't contain Pinotage. A very good result for Boplas and Cape Point Vineyards each with three wines. I'll bet the Woolies shelves have already been emptied of that Sauvignon Blanc! South African wine specialists CyberCellar have mixed packs of 2008 5* winners. CyberCellar now deliver SA wines in the UK and USA as well as South Africa. They say they can deliver almost anywhere on the planet! Tired of the constant sniping at Pinotage on the UK Wine Forum from those who say they dislike the variety, Keith Prothero bet all-comers £200 that they could not detect a Pinotage when tasted blind with other wines. And from a line-up that included Chateau Mouton-Rothschild, Clos Vougeot Grand Cru Chopin-Groffier, Ornellaia, and Jaboulet Hermitage La Chapelle only two of the ten contestants correctly identified Grangehurst 2000 as the Pinotage. More than £1100 was raised for Keith's favourite charity, The Pebbles Project which offers support to children with special educational needs, particularly those whose lives are affected by alcohol in the Western Cape of South Africa. Keith Prothero, who lives in the Cape for six months every year and is a partner in a soon to be launched Swartland winery, has been a supporter of the Pebbles Project from its beginning. Contenders paid £100 to cover the cost of the meal and wines in a London restaurant and stood to take home £200 if they identified the Pinotage. But it proved harder than they thought. One wine-lover thought Grangehurst 2000 Pinotage was Mouton Rothschild while another picked it as their Wine of the Night, saying that it was "Medium dark, some slightly age. Brilliant nose, very open, chocolate and gamey. Palate is rich, with undergrowth, pepper and fruit. A lovely streak of bright acidity runs through this, almost like a Germanic wine. But also has menthol character like a Henschke, and some austerity like a Rhone. Maybe a very good Hermitage?" The two winners kindly donated their prizes to Pebbles. Now Keith is taking his challenge north. Whatever the individual results, the one certain winner will be the Pebbles Project. This article was originally published in the July issue of WineLand magazine under the title 'Spot The Pinotage'. Back from two days at the Festival of History. We spent all Sunday there before returning to the hotel to pick up our car, then it was a tiring drive back down the M1 motorway. We collected a takeaway from Mumtaj (Karachi Kebab & Chana Massala for me). We were hungry and tired so I just grabbed a handy wine which happened to be Morrison's 'The Best' 2005 Pinotage. And what a little cracker it is. Ignore the ghastly label, there are lots of bright blackberry fruits, no rough edges, just pure drinking pleasure. In fact I have tasted this wine before. It is made by Bellevue Estate where it is available as part of their new empowerment project wine range under the Sizanani label. (and by chance I enjoyed the matching Chenin Blanc at a barbecue a couple of weeks ago). I must return to this Pinotage and pay it more attention. 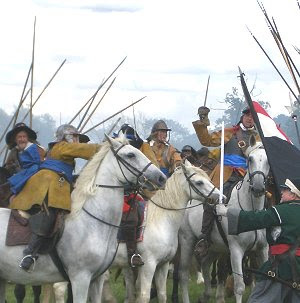 We spent the weekend at the Festival of History. There were hundreds and hundreds of historical reeanactors and we watched battles between Vikings and Normans, Parliamentarians against Royalists (pictured left Sir Thomas, Lord Fairfax commanding the Parliamentarian Army, surveys the battlefied), First World War German Triplanes strafing a British Army patrol, Roman legions drill and more. 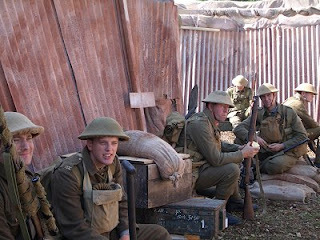 There were encampments representing forces from the Bronze Age up to the 2nd World War, even a Boer fighter's camp. There were mediaeval smithies pumping leather bellows to forge iron tools, knights jousting, birds of prey, jesters and many wood fires cooking everything from whole pigs to bread. And the constant sounds of explosions from cannons, mortars, flint-lock guns, maxims and massed musket fire. There were historical workshops and talks by eminent historians. But we found no wine at the Festival other than Elderberry Port (are they allowed to call it that?) and other fruit wines in the souvenir marquee. So back at the hotel I scanned the wine list with a sinking heart, and settled on Cullinan View 2005 Pinotage. This is a brand that I have only seen in hotels and the last time I ordered it it many years ago, it- the 97 vintage - was very disappointing. However this 2005 vintage wine (Wine of Origin Robertson) was delightful; light bodied with an abundance of raspberry fruit flavours. Really shows how good even basic Pinotage is these days. The number A280 on the back label shows it was produced by Robertson Winery. Well done chaps! We enjoyed it so much that we ordered another bottle the following night. Cost £15.95 but a quick Google shows the price varies greatly depending how rapacious the markup is. On Robert Parker's forum Guy Des Rosiers is impressed by a 1998 Beyerskloof. 1998 Beyerskloof Pinotage. Fully mature, delicate and complex, but with plenty of fruit left, this was a real gem. To give you an idea of the quality of this wine, we also drank a bottle of 2004 Termes that evening. The Beyerskloof was far and away WOTN* (the Termes, of course, was very tannic and young, but the quality was unmistakable. Yet the Beyerskloof still stood out). When I looked up this producer and realized that the current release of this wine costs about $10, I was shocked. Guy told me "I just wish I had taken a more detailed note on the 98 Beyerskloof. It was truly an impressive bottle of Pinotage." 2003 Beyerskloof Pinotage. Quite dark, medium-bodied, juicy. Sweet fruit. Tobacco, leather, roasting meat and a distinct rubbery character. Soft tannins, decent finish. Not as good as Kanonkop but very good for me. Went nicely with risotto and Italian sausages. It may seem a bit odd but this went really well with olives stuffed with pimentos which really brought out the sweetness and fruit in the wine. Thanks to both Guy Des Rosiers & Jay Labrador for permission to reproduce their tasting notes. Michael Olivier (pictured right) is a food and wine writer, broadcaster and hospitality industry consultant -- and runs Noshnews which is South Africa's premier wine & food website. He emails to say: "I made this dish today and thought of you and your pppppassion for PPPPPinotage and thought you would like to have this recipe - it comes with my love." I attended a launch of a Pinot Noir recently at Caveau at the Josephine Mill in Newlands. If you live in Cape Town and have not visited there, hasten towards it at your earliest possible convenience. The main course was a traditional Burgundian dish Coq au Vin. I thought of Boeuf Bourguignon a traditional Burgundian beef dish made from a braising beef and Pinot Noir and a staple of every self respecting 1970’s Bistro. Further thought lead me to create a dish made with Pinotage, our native South African grape. Using the components of both the Coq au Vin and the Boeuf Bourguignon, and taking a bit of license with the cut of beef, perhaps more Osso Bucco than braising beef, I landed up with this dish which I think does credit to Pinotage and the men and women who make it. Preset the oven on 180C. Prepare the seasoned flour by sprinkling a thick layer of flour onto a dinner plate and seasoning it well with sea salt, freshly milled black pepper and sweet smoked paprika. Reserve any left over flour for later use should you decide to thicken the sauce. Have ready a large ovenproof cast iron casserole with a thin layer of sunflower oil in the base. Heat the oil, and two to three pieces at a time, dip the meat into the seasoned flour and brown slowly but well on both sides, setting aside on a large plate to catch any juices which might run off. When all the meat has been browned, wipe the casserole out with kitchen paper and cover the base with the olive oil. Add the onions and braise over low heat until turning golden. Add the garlic and stir fry for a while, add the celery and stir fry again. Add the thyme and bay leaves then pour in the bottle of Pinotage and bring to the boil, and simmer to reduce the wine by at least half. Add the beef stock, the tomato paste, the chorizo and the pickling onions. Season well and add back the meat and the juices which have collected on the plate. Cover and cook in the preset oven for 2½ hours at least, remove from the oven and skim off any fat on top which may have accumulated there. If the meat is tender, adjust the seasoning if necessary and serve. You may want to reduce the sauce a bit by taking it off and boiling it in a small saucepan to the right consistency. Pinotage is called for and Grangehurst, Landskroon, Onderkloof, Simonsig Redhill, Swartland or Mountain Oaks [Organic Pinotage no less] would do admirably. Many thanks Michael for the recipe -- sounds delicious -- and that is an interesting selection of recommended wines including yet another one new to me. I must add Onderkloof to the list. Though since we're'cooking with Beyerskloof I would be tempted to have a Beyerskloof Reserve in my glass. 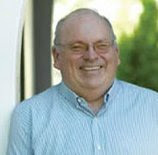 Paul Bulas lives in Canada and counts Pinotage as his favourite vinifera wine -- because Paul is a passionate champion of native American and hybrid varieties. Paul has contributed many tasting notes to the Pinotage Club over the years, and in this open letter to South African winemakers he tells of his own experiences and love of the variety. My first experience with Pinotage came in 1998 - it was a 1995 Zonnebloem from Stellenbosch. I had never before tried varietal Pinotage simply because I hadn't known about it. I was immediately struck by the uniqueness of its aromas compared to those of the ubiquitous Cabernets and Merlots that I was focusing on in those days. 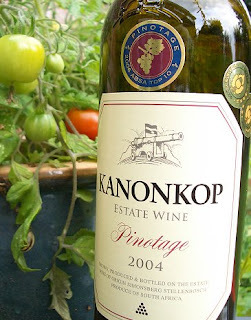 Pinotage had its own distinctive nose typically comprising wild strawberry, banana, earth, elderberry and leather. I was fascinated by the uniqueness of this wine which, although strictly speaking was a "New World" wine, had something very serious and classical about it. I later came to more precisely identify that character as being a mix of jubilant forward fruit married to a savoury mid-palate and a stern, dry, tannic structure - all these aspects being fascinatingly intertwined into a single wine. I loved the Lapsang-Souchong-like smokiness in the finish, as well as the similarity of the finish to certain black-skinned table grapes that can have a nice tannic kick when you chew the skins. I also immediately found foods that I felt matched naturally with Pinotage, and began buying more Pinotage after that one tasting than any other red vinifera wine. Over the years I have found that Pinotage goes really well with any food containing tomatoes, eggplant and bacon (the savoury aspect marries well to these) as well as sharp, old cheeses. Beefsteak grilled over hardwood coals is yet another sublime match; I especially enjoy oaked Pinotage with this (oaked Pinotage is actually my favourite sort in general). Cheddar cheese and potato perogies topped with fried bacon bits and onions - a well-known meal among those of Polish extraction! - is a surprising but very apt match for quality Pinotage as well. And I can't think of any better wine to serve with any food cooked outdoors over hardwood - in effect, braaied food - than Pinotage. In recent times, it seems, the debate has heated up over whether Pinotage should even be South Africa's flagship variety - and there are voices that even call for its outright elimination from Cape Blends. I cannot ally myself with those views, since what they entail is that South Africa should simply get on the bandwagon of conformity and uniformity, and just produce more of the standby wines that are already so prevalent around the world. Now, this is not to say that South Africa's Cabernet Sauvignon, Merlot and Shiraz aren't world class - they most certainly are - but surely Pinotage is a grape that first appeared on South African soil; it is a uniquely South African creation; there is history behind it, and the wine is unlike any other. This, and the fact that quality viticultural and winemaking techniques are available today, should be reason enough to see the value in making top-notch estate-grown Pinotage for SA wine lovers and the rest of us who love SA wine to enjoy. This Canadian is a supporter of Pinotage who really would like all South African producers to know that they are doing something wonderful: they are adding to the diversity of the world wine tapestry by producing fine varietal Pinotage. Please continue making the finest, most classical Pinotage wines you can. Don't listen to the hype out there that would see this classic South African red grape torn out or relegated to low-quality bulk wines. Pinotage is a wine that has many admirers, and I hope that this fact will always be your strength and hope as you work in the vineyards and cellars of South Africa's winelands. Thanks Paul, and remember that I am keeping a bottle of Zonnebloem 1994 Pinotage in my cellar for your next visit to England . Unless you store them yourself, mature Pinotages are hard to find. However there is good news if you are in South Africa. 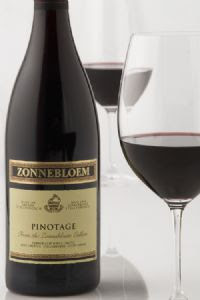 Zonnebloem have announced that they are releasing a limited amount of 10 year old Pinotage. They have been retained for optimal maturation after the initial release of the Zonnebloem Pinotage 1997. They say this is now at its peak in terms of quality and maturity - "Made in a fruitier style, the Zonnebloem Pinotage 1997 is deep ruby red in colour with ample strawberry flavours and well-integrated wood and tannin structure. " Zonnebloem Pinotage 1997 is available exclusively from Makro at around R54.90 which seems a remarkably reasonable price for a 10 year old wine. Based on my recent experiences, I'd try one bottle first before splashing out on a case.